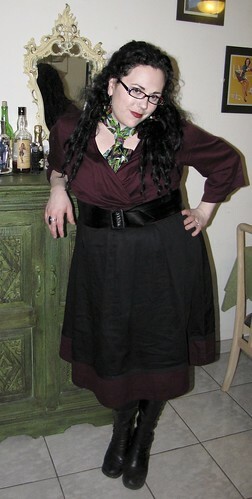 I have worn this eShakti dress in the past, but I always thought it was a little boring. I liked how the maroon in the top was echoed as a wide stripe on the bottom, but that was really the only interesting thing about the dress. That’s when I decided to try and find a scarf to spice it up a bit. 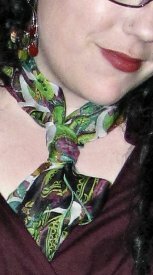 It took a few months, but this last weekend, on a shopping trip with my Mom, sisters and cousin I found this gorgeous paisley scarf. It’s dominant colour is a beautiful green I like to call “monster” green but it has purple/maroon shade through it that matches the dress perfectly. I plaid with different placements of the scarf through the day. At first I had it on the outside with it hanging really long down the front, but then half way through the day I decided to tuck it in and really liked how it looked. I think I would wear it outside again, but I would try to pair the dress with a long vest that flares out near the bottom to mimic the dress. If anyone happens to know where to find something like that, please drop me a line. Oh you may notice that the second picture is a bit blurry. I decided to try out Picnic on Flickr, and I created a scarf detail photo using their software. It’s not great, but good enough for the purposes of this post.